Larry Hart “went back to school” when he returned to Amphitheater in 1953, the high school from which he’d graduated four years earlier. 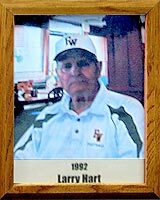 This time, with a degree from the University of Idaho, he was Mr. Hart, English and Phys-Ed teacher and coach of JV football and basketball, as well as varsity track. During the ensuring years, Larry taught and coached at Ajo High in Ajo, Arizona, Agua Fria Union High in Avondale, Arizona, and Flowing Wells High in Tucson. His 25-year football coaching record includes 146 wins and his team piled up 8 Division titles, became State runner-ups 5 times, were undefeated in regular season play 3 times, and at Flowing Wells, were undefeated State Champions in 1975. Larry, who retired in 1987 as Assistant Superintendent of Flowing Wells High School, is a past president and lifetime member of the Arizona Coaches Association, has served on the Board of Directors of the Arizona School Administrators and is a past president of the Arizona Interscholastic Association. He was also named AA Southern Division Coach of the Year 8 times; was several time honored as Coach of the Year by the Arizona Daily Star and Tucson Citizen, and served twice as Head Coach of Arizona Coaches Association All-Star Football games, including the 1977 Arizona/Utah meeting. He received the Tucson Conquistadores Special Recognition Award for Football Coaching in 1971 and 1975.